Recently a new Lao restaurant has opened up in Tribeca, featuring modern interpretations and very Tribeca pricing. For a city completely devoid of legitimate Lao options or community, this seems like a slap in the face, and not the type of place you might take your Lao grandmother. Don't get me wrong, I hope it starts a trend, but for now, I will not be paying upwards of $30 for entrees inspired by an impoverished nation with rich culinary tradition. 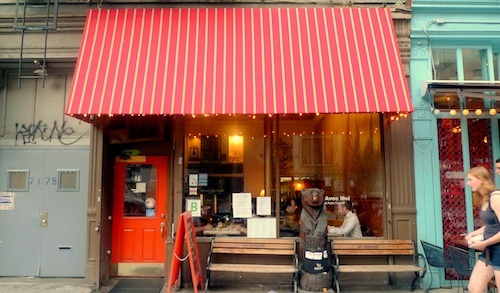 In the meantime, there is Jeannie, the joyful Lao chef manning the kitchen of Mangez Avec Moi, a completely generic pan-Southeast Asian restaurant also in Tribeca. She has been cooking Lao meals for those willing to call ahead for some time now. Last year, I attended a meal put together by Charles of United Nations of Food, and was blissfully rewarded. 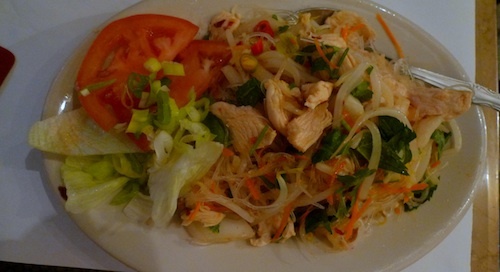 To that point, the closest Lao to New York City was at the East-West Grille in Hartford, Connecticut (highly recommended by the way). This is the kind of meal where you just say "Chef, do what you please." And she did. Our group of six was treated to many courses and a range of happy hospitality at very reasonable prices. We all had beer and paid a little more than $30/head when it was all said and done. 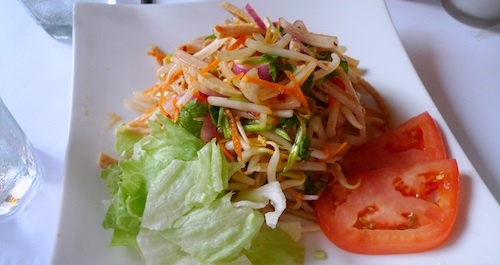 To get our mouths watering and our foreheads beading sweat, she brought out the yum yor ($12, below), a salad with Lao ham, carrots, onions, fresh chili, and sprouts. 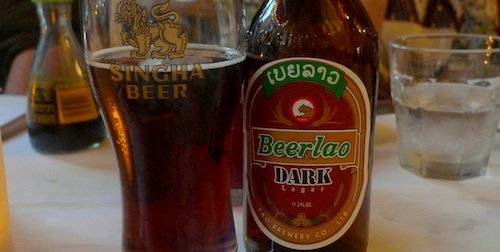 Make sure everyone has plenty of sticky rice, served in nice bamboo baskets (above), and even more Beerlao Dark (below), which is one of the two best beers brewed in Southeast Asia along with Myanmar Beer. The Lao style grilled beef jerky ($12, below) is nice and has a good tenderness, but honestly was probably the weakest item in a very strong field. On a smaller meal, I would pass over this one. Many people are familiar with Isaan sausages from good Thai restaurants. Isaan province borders Laos and as you can imagine shares many things in common with the cuisine. The Lao sausage ($12, below) is more interesting than it might appear if you have not had a similar dish before, full of flavor and a softer texture than its German or Eastern European counterparts. 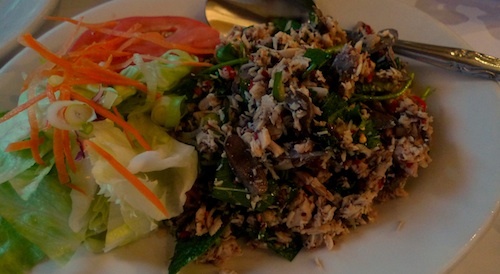 I am always excited about larb, and was waiting for the version she makes here, spelled larp ($15, below) on our bill. This dish was probably accompanied by the most frequent refills of our water glasses as it packed a very powerful punch, as it should. This is some pretty fantastic stuff, eaten as an appetizer or entree. 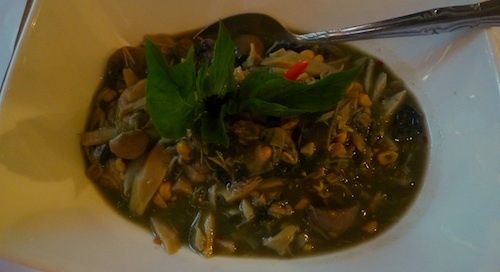 Another favorite of mine for the night was the bamboo stew ($15, below), which was bigger than it appears in the photo. It is full of bamboo, lemongrass, and plenty of pepper. The dark broth is a touch oily and very dense. Our final savory plate was the yum chen home ($12, below), a glass noodle salad with chicken that was very good but possibly could have benefitted more by being served before the spicy dishes. 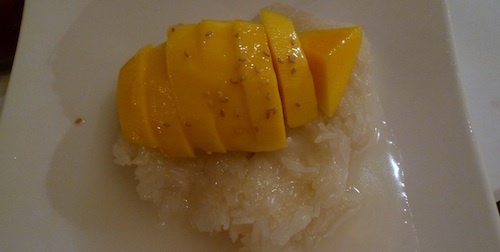 By this time we were all nearing the fullest extent of pain possible from stomach expansion, but felt like a little sweetness would not hurt, ordering the sticky rice with mango ($9, below). This dish when in the hands of a professional is always a crowd pleaser and did not disappoint here. A wonderful finish to a wonderful meal.